It's Transformer party time! Carson invited Cameron and Nicole over for his birthday. We had pizza and cake. 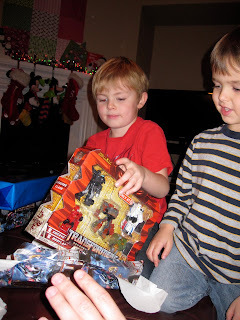 The boys played Transformers and had a great time. Carson said this was his best birthday ever! On the 24th day of Christmas . . .
On the 23rd day of Christmas . . .
On the 22nd of Christmas . . .
On the 21st day of Christmas . . .
On the 20th day of Christmas . . .
On the 19th day of Christmas . . .
On the 18th day of Christmas . . .
On the 17th day of Christmas . . .
On the 16th day of Christmas . . .
On 15th day of Christmas . . .
On the 14th day of Christmas . . .
On the 13th day of Christmas . . .
On the 12th day of Christmas . . .
On the 11th day of Christmas . . .
On the 10th day of Christmas . . .
On the 9th day of Christmas . . .
On the 8th day of Christmas . . .
On the 7th day of Christmas . . .
On the 6th day of Christmas . . .
On the 5th day of Christmas . . .
On the 4th day of Christmas . . .
On the 3rd day of Christmas . . .
On the 2nd Day of Christmas . . .